We’d love your help. Let us know what’s wrong with this preview of A Riot of Goldfish by Kanoko Okamoto. To ask other readers questions about A Riot of Goldfish, please sign up. Reading Kanoko Okamoto's "A Riot of Goldfish" was something semi-romantic and sentimental due to her country plot depicting the relationship between Mataichi, a low-class goldfish breeder, and Masako, a beautiful lady living with a wealthy father in the house on the cliff in a valley in the central Yamanote area of Tokyo. Eventually, Teizo (Masako's father) talked to Sojuro (Mataichi's father) and Mataichi agreed to study further on goldfish breeding under Teizo's tuition support. They meet occa Reading Kanoko Okamoto's "A Riot of Goldfish" was something semi-romantic and sentimental due to her country plot depicting the relationship between Mataichi, a low-class goldfish breeder, and Masako, a beautiful lady living with a wealthy father in the house on the cliff in a valley in the central Yamanote area of Tokyo. Eventually, Teizo (Masako's father) talked to Sojuro (Mataichi's father) and Mataichi agreed to study further on goldfish breeding under Teizo's tuition support. They meet occasionally and their relationship gradually develops, Mataichi falls in love with her but she doesn't assure anything except their friendship and his succes from his study and future as the one who would breed a unique goldfish with its surpassing beauty for Masako. While studying and working on his project, he is literally heart-shattered due to the information on her marriage and having a baby soon. I liked this part depicting such an ill-at-ease scene between Mataichi and his presumably former girlfriend whom he thinks she would love him as well. Mataichi had a few moments of bated breath until the door to the parlour opened halfway and Masako, sporting a surprisingly bashful expression, angled her upper body into view. Like a child, she hid her face behind the door, then opened it properly. … Mataichi kept looking at the floor and, feeling that he had lost a battle of wills, crawled sadly back into his lonely shell. As for the rest of the story, I would like to invite my GR friends to read farther on so that you would know and understand more on how the climax, after his goldfish breeding struggle for fourteen years, eventually comes. … His own father had told his mother to tell him he hadn’t asked to be born either if his son ever complained about being brought into this world, and as he thought back on that tonight it seemed like a conclusion his father had reached only after a great deal of thought. Now Besshiro’s son was saddled with a fate that he did not understand. In brief, “A Riot of Goldfish” is more interesting than “The Food Demon”. 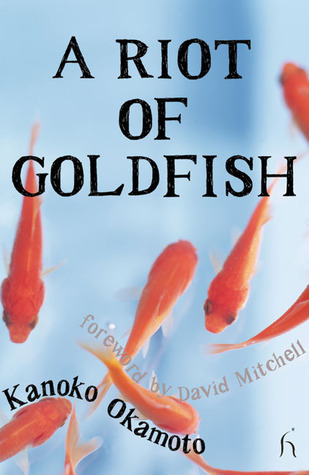 A Riot of Goldfish contains two novella’s where men are the main characters. Both A Riot of Goldfish and it’s companion The Food Demon are ‘small’ stories, they don’t have a real plot and they focus on just one specific theme. In the first story, the adopted son of a goldfish breeder is completely enamoured by his classmate, the daughter of his rich patron. But she is out of his league, so instead he aims to create the perfect new breed of goldfish. And that despite the fact that he is really not all that interested in goldfish breeding. In the second story we learn about Besshiro, his relationship with cooking food, and how he got to this point in his life. I also read 'A Mothers Love' by Kanoko Okamoto. A Mothers Love demonstrates the early tradition of amne. A mother is sad and emotionally crippled by her sons departure from herself, from Japan and its traditions, to go to France and study art. Its shows a mothers struggle to let go when her whole life is based on her child's ambitions. It also shows a split between the generations, with the older generation valuing old Japan, and younger generations accepting Western influence. The West are seen I also read 'A Mothers Love' by Kanoko Okamoto. A Mothers Love demonstrates the early tradition of amne. A mother is sad and emotionally crippled by her sons departure from herself, from Japan and its traditions, to go to France and study art. Its shows a mothers struggle to let go when her whole life is based on her child's ambitions. It also shows a split between the generations, with the older generation valuing old Japan, and younger generations accepting Western influence. The West are seen as both giving and damaging, which was a common theme in literature in the 20th century for obvious reasons. Two poignant stories exploring frustration, self-worth and trying to make your mark in the world. Set in Japan in the years between the two 20th century world wars, they show a nation caught between the old feudal way of life and the thrusting modernity brought in by the Meiji era. The men are largely frustrated and unsettled by their inability to grasp the opportunities modernity seems to offer them, while the women float serenely above them. An interesting pair of stories. Honestly, I only read the first short story, because I have university books to read, so I have to prioritise what I'm reading... and this wasn't one. I thought it was quite slow going, probably because it's very character based, and that's not my personal favourite in reading (but then again, most short stories are character based, so what did I expect lol). I honestly didn't think much of A Riot of Goldfish, I found it boring, especially with the main character always feeling sorry for himself Honestly, I only read the first short story, because I have university books to read, so I have to prioritise what I'm reading... and this wasn't one. I thought it was quite slow going, probably because it's very character based, and that's not my personal favourite in reading (but then again, most short stories are character based, so what did I expect lol). I honestly didn't think much of A Riot of Goldfish, I found it boring, especially with the main character always feeling sorry for himself, and being so... useless, if I may use that word. There was honestly two moments reading it where I thought that it actually made sense, which is why it's two stars and not one. I really liked Okamoto's descriptions of nature and her vivid use of colour. I also thought that her characterisation was good, and Mataichi's obsession with both Masako and goldfish was interesting. I can't quite put my finger on why I didn't love this book, but I just don't feel like giving it more than 3 stars. This book is really two novellas, or more accurately, two long short stories, by a female Japanese writer of the 1930’s. The Goldfish story of the title is about a man from a poor family whose occupation is raising goldfish for show ponds and breeding new varieties. He’s in love with a beautiful young woman who lives in the big house on the nearby hill, but he’s from a poor farm family so he can only watch from a distance as she marries, has children and lives her life oblivious of him. Raising This book is really two novellas, or more accurately, two long short stories, by a female Japanese writer of the 1930’s. The Goldfish story of the title is about a man from a poor family whose occupation is raising goldfish for show ponds and breeding new varieties. He’s in love with a beautiful young woman who lives in the big house on the nearby hill, but he’s from a poor farm family so he can only watch from a distance as she marries, has children and lives her life oblivious of him. Raising the perfect new species of goldfish becomes his life’s obsession as a substitute for his unrequited love. There is a remarkably modern line about genetics when the author writes, to the effect that, maybe the goldfish picked us humans to advance their genetic success – like the idea of memes. The second story, the Food Demon, is remarkably modern as well. A wealthy family hires a young man as a chef to train their two daughters how to cook. The real story is not a romance, as might be expected given that entrée (pun intended), but is truly a story of a man obsessed (like the goldfish breeder) – but in this case with food and cooking, specifically the art of cooking, and his belief that cooking as art substitutes for his lack of formal education. The author tells us the unusual idea that the chef was brought up among the lower class “by mistake.” His culinary specialties are a fusion of Japanese and Western cuisine. Both stories are remarkably modern for stories written by a Japanese woman in the 1930’s and remarkably Western as well. Peculiar book really, and possibly the first time that I’ve gone back to a Foreword and found it enlightening rather than simply a gratuitous re-telling of the story. David Mitchell gives context to when Okamoto was writing, and how the sometimes flowery style went down at the time. But more importantly, he also mentions that the title novella reads sometimes like the sketch for a longer book. And that’s where it doesn’t work. For much of the time Okamoto breaks the golden rule of telling the st Peculiar book really, and possibly the first time that I’ve gone back to a Foreword and found it enlightening rather than simply a gratuitous re-telling of the story. David Mitchell gives context to when Okamoto was writing, and how the sometimes flowery style went down at the time. But more importantly, he also mentions that the title novella reads sometimes like the sketch for a longer book. And that’s where it doesn’t work. For much of the time Okamoto breaks the golden rule of telling the story rather than showing it. I’d thought it might have had something to do with the translation, so was relieved that Mitchell – despite lauding the writer – nevertheless mentions what felt like a fatal flaw. I must admit that I couldn’t face the second of the two stories. It really was a pleasure being in Professor Vincent's class at BU, and I can assure everyone that you're in good hands or a translator. I encourage those that pick up these two short stories to read the foreword and introduction to Okamoto's work and life. The stories are simple, brief, and contain so much complexity. Much like a waka (extended haiku) poem. Coming from a Western point of view, and as Vincent or Mitchell mentioned prior to the stories, I felt like these both could have been expan It really was a pleasure being in Professor Vincent's class at BU, and I can assure everyone that you're in good hands or a translator. Coming from a Western point of view, and as Vincent or Mitchell mentioned prior to the stories, I felt like these both could have been expanded upon to be more of a novel each. Especially "The Food Demon". A Riot of Goldfish had an original and interesting premise, and the Food Demon had some interesting scenes (eg the dancing man on his deathbed) but can't say I was particularly engaged throughout either of these two novellas. This novella is about a mans quest to crate the perfect goldfish. It is enjoyable, although despite only being around 50 pages long it took longer than expected to read. I enjoyed the plot, it was simple but good. The ending was very satisfying also. Four stars for the title story, five for undercard "The Food Demon." Kanoko Okamoto (岡本 かの子 Okamoto Kanoko?, 1 March 1889 - 18 February 1939) was the pen-name of a Japanese author, tanka poet, and Buddhist scholar active during the Taishō and early Shōwa periods of Japan.